Home builders reversed their one month decline in sentiment as the April NAHB/Wells Fargo Housing Market Index increased 4 points to 56 from a one-point downwardly revised 52 in March. The bounce back up to the January-February average suggests the March observation was an outlier. All three components revived to or above the early part of 2015. Current sales index rose 3 points to 61 matching the February level and 1 point below the January report. The expected sales component rose 5 points to 64, the highest in 2015, and the traffic component rose 4 points to 41. 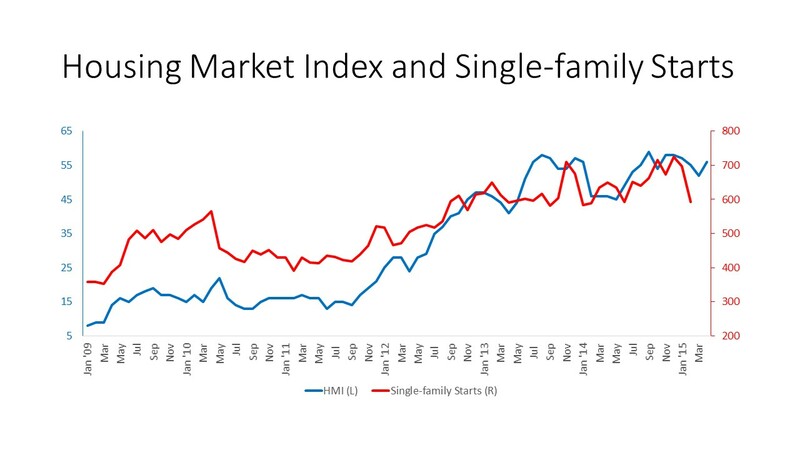 The solid and significant increase in expectations suggests builders are expecting the market to continue growing. Regionally, the outcome is more mixed, with the Northeast holding steady at 42 for the three-month moving average, the South rising one point to 56, the Midwest falling three points to 54 (but the only region that saw an increase from February to March) and the West dropping 3 points to 58. Builders continue to be concerned about lot availability and, to a lesser extent, labor availability. The rising cost of these scarce resources along with rising cost of materials continues to squeeze builders’ profits. Builders report consumers remain convinced that they have bargaining power on price and some sales fail because their offers or price maximums are below the cost of construction. Even with rising existing home values, construction costs including rising land and labor costs are making it more difficult to meet buyers’ expectations and compete with the alternative.